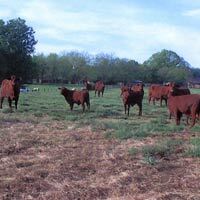 The O'Bryant Ranch has a small cattle enterprise of approximately 60 head of pure blood Santa Gertrudis beef cattle. 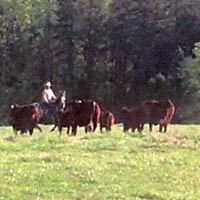 All cattle are raised on our own pastures and produce excellent quality beef. These cattle are registered with the Santa Gertrudis Breeders International as herd # 7387. Herd #1 has mostly polled heifers, cows and a large breeding bull. Herd #2 has polled heifers, cows, several bulls and a primary breeding bull. These beautiful dark red beef cattle carry the genetics traits from the original Santa Gertrudis breed developed from the foundation herds of the 1920's and 1930's. 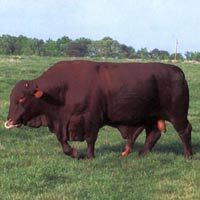 Sales of cattle for breeding and beef available at all times. Call 336-908-0276 for pricing.